For the Bordeaux wine producer, see Château La Louvière. La Louvière (French pronunciation: ​[la lu.vjɛʁ], Walloon: El Lovire) is a Walloon city and municipality located in the Belgian province of Hainaut. 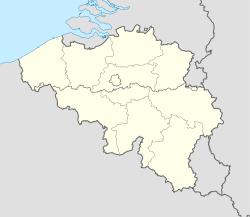 La Louvière's municipality includes the old communes of Haine-Saint-Paul, Haine-Saint-Pierre, Saint-Vaast, Trivières, Boussoit, Houdeng-Aimeries, Houdeng-Gœgnies, Maurage, and Strépy-Bracquegnies. La Louvière is the capital of the Centre region, a former coal mining area in the sillon industriel, between the Borinage to the West and the Pays Noir to the East. The legend of a mother wolf nursing a child at La Louvière is reminiscent of the mythical birth of Rome. The true origin of the city, however, dates from the 12th century. At that time, the forested, and presumably wolf-infested, territory of today’s La Louvière was named Menaulu, from the Old French meaning “wolf’s lair”. This land was part of the larger community of Saint-Vaast, which itself belonged to the Aulne Abbey. By 1284, the name of the territory had been translated into Latin, then back into French to its current name of La Louvière. The lords of Saint-Vaast encouraged prospecting on their land, which led to the first extraction of coal in the year 1390. The abbey’s refusal to provide necessary infrastructure, however, delayed large-scale development until the 18th century. In the 19th century, the construction of roads, canals, and railways finally allowed the local coal production to be exported. Investments also poured into the local industry to take advantage of the abundant source of energy. La Louvière quickly surpassed its overlord Saint-Vaast, both in population and economic wealth. Within fifty years, the territory that was not much more than a place name had become one of the most important cities in Wallonia. La Louvière was recognized as an independent city in 1869. Today, La Louvière is still the fifth largest city in Wallonia, after Charleroi, Liège, Namur, and Mons. There are four hydraulic boat lifts on the old Canal du Centre, which connects the Meuse River to the Scheldt. These double elevators date from around 1900 and were designated by UNESCO as a World Heritage Site in 1998. The housing complex that was built for the Bois-du-Luc coal workers during the first half of the 19th century has been restored. This is part of the Major Mining Sites of Wallonia, designated by UNESCO as a World Heritage Site in 2012. One of those houses can be visited, together with a couple of museums retracing the history of the coal mining industry in the Centre region. La Louvière counts a number of chapels and churches that date from the 13th to the 16th century. La Louvière also has one of the best collection of Idel Ianchelevici’s works on display. La Louvière has an oceanic climate typical of Belgium with moderated seasons even for its inland position at 50° latitude, as a result of Gulf Stream influence. The Carnival of La Louvière is called Laetare, after the Latin verb meaning “to enjoy” (the introit at mass on the fourth Sunday of Lent begins Laetare Jerusalem, Rejoice Jerusalem). It lasts three days, Sunday to Tuesday, and takes place in the middle of Lent. The Gilles are out on all three days, stomping to the rhythm of their music and distributing oranges to the passers-by. Giant puppets and various other groups also take part in the parades and festivities. Typical of La Louvière’s celebrations is the so-called Brûlage des Bosses (“burning of the humps”), where a puppet dressed as a Gilles is burnt to symbolize the end of carnival and beginning of a new life. La Louvière used to have a top level football club in Belgian First Division: RAA Louviéroise. They won the Belgian Cup in 2003. the club no longer exists as it merged into a team based in another city and its La Louvière playground is now the home of third division semi-amateur club UR La Louvière Centre. ^ "İki Yeni Kardeş Şehir". Municipality Council Meeting. Giresun Municipality. 2016. Retrieved 1 July 2016. Wikimedia Commons has media related to La Louvière.